Haredi school system nearly doubles in size in since 2000, overtakes national religious as second largest in Israel. Israel’s haredi school system is growing by leaps and bounds, as evidenced by a new report released by the Ministry of Education. While only about 10% of Israeli Jewish adults identify with the haredi religious stream, the haredi school system now accounts for a full 25% of all Jewish students in Israel. Even more impressive is the rate of growth in haredi schools over the past decade and a half. From 2000 to 2015, the total haredi school population increased by a whopping 89%, far beyond the increases seen in either of the two other Jewish school systems. In the year 2000, roughly 17% of Jewish students were enrolled in the haredi system, as opposed to just under 19% in the national religious system and 64% in the secular state school system. Over the next 15 years, the haredi system added some 190,000 students, becoming the second largest system with 25% of Jewish students. The national religious state school system added 64,000 students, an increase of 27%, and remained stable at just under 19%. The secular state school system grew by only 11%, adding 97,000 students and slipping from 64% of the Jewish population in 2000 to just 56% in 2015. If these trends continue, by the year 2030 the secular state system will represent a minority of Jewish students, with only 46% of the population. 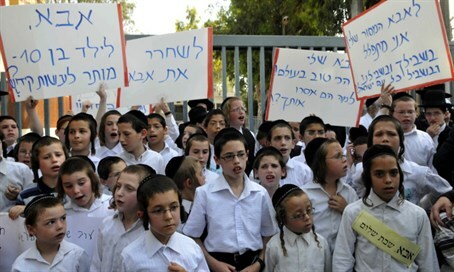 Haredi students will make up more than a third of the Jewish school-age population, with roughly 36%. The national religious system will fall slightly to 18% of all Jewish students.